A very stylish and, by today's style in the kitchen department, somewhat outmoded, Watercress Drainer and Stand from Carlton Ware. Nonetheless, this very attractive duo still have a place as a general salad drainer and what better way to present such a salad to the diners. 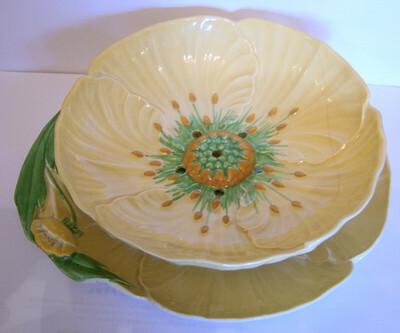 The Drainer (number 1515) is a round yellow dish with 5 holes for drainage.This plate measures 7 inches (18 cms) in diameter. It is in excellent condition though there is some light crazing evident. The under Plate (number 1482) is identical in colour and design to the Drainer. It has a maximum length of just under 9 inches (22 cms) with a maximum width of 8 inches (20 cms). It, too, is in excellent condition with some light crazing evident. This is one of two currently available on this site.